You are currently browsing the tag archive for the ‘zomato’ tag. 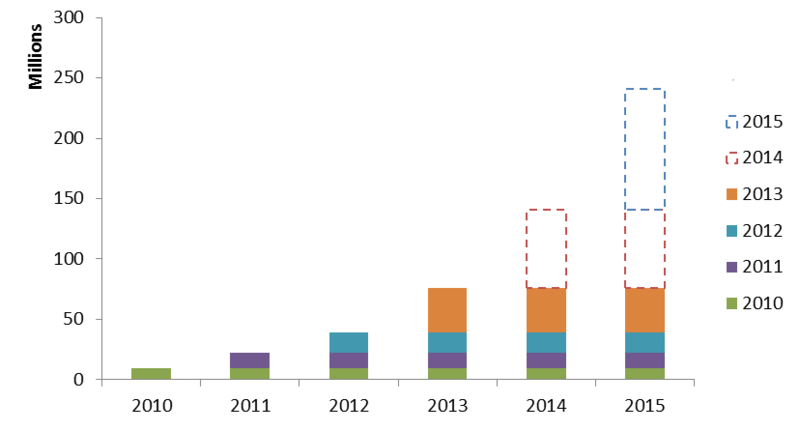 India is seeing an explosion of smartphones’ installed base (chart below). This is leading to a burst in data consumption – Airtel’s mobile data consumption doubled in Q3, FY14 vs. Q3, FY13 and data revenue has become a quarter of the company’s total revenue. We are starting to get onto the early part of the S-curve in terms of mobile-data growth. Online transactions businesses like OTAs (MMT, Cleartrip, Yatra) are nearing 40% of their users on mobile and ecommerce companies (Flipkart, Snapdeal) are seeing 20-30% transactions from mobile. This trend will continue as smartphones will have deeper penetration than computers in India and for many people a smartphone will be their first and only connected device. Also being a personal device, a smartphone is more accessible than a computer even for users who have both. This smartphone base will lead to creation of opportunities across sectors and an interesting one is in local businesses. Globally, Lightspeed has invested in companies like Sidecar (transportation), Grubhub (food), Styleseat (beauty stylist) which are betting on transferring demand generated online to local services fulfilled offline. We believe this trend will be led by mobile (smartphones) in India. The current leader in connecting demand online to service providers offline in India is JustDial – mobile data traffic on JustDial is now more than 22% of total traffic, up from 12% in FY13 and 5% in FY12, and this will likely inflect more sharply with increasing smartphone penetration. Since JustDial is a horizontal and doesn’t provide a category specific experience it may be hard for JustDial to do more than generate leads for local businesses. JustDial is valued at around $1.8B and that points to an opportunity for vertical specific platforms that can provide a better value proposition to consumers and local businesses by leveraging smartphones. The smartphone as a medium has the potential to provide a disruptive value proposition by taking an interested lead a few steps further and converting it into an informed and highly qualified potential customer (or even a transaction). Given access to rich content, fine location and direct calling at the moment of consumer need, a smartphone is uniquely positioned to provide a category specific experience that is not possible on a phone (non-smartphone) or a computer. We are already seeing this happen in verticals like transportation (Ola, Uber, TaxiForSure) and food (Zomato). More verticals where there is an unmet consumer need and an opportunity to leverage smartphone capabilities are healthcare, break-fix and education/vocation. Design the business to be mobile-first: Have a responsive mobile design or an app. The good news is that 90% of new smartphone sales in India are presently Android (unlikely to change anytime soon), so a majority of the market can be covered by focusing on Android. Create a consumer experience specialized for the category: Take users as close as possible to the offline transaction. For example, the difference between looking for a restaurant on Zomato vs JustDial is substantial. Another great experience is to see an Uber cab move towards oneself once one books it in their app. Create consumer side entry barriers: Once the platform has early traction, elements like an active community, crowd sourced reviews/information can help retain leadership. Pagalguy and Team-bhp are two strong Indian communities and have grown despite popular belief that Indians do not like to contribute user-generated content online. Provide incremental revenue opportunity to merchants: Local businesses in India are most excited to embrace technology if it helps acquire new customers (they are much slower in adopting technology to boost productivity). Instrument RoI measurement early on and make it a core part of the merchant pitch. For example, Zomato had very early on embraced cloud telephony to track calls generated from their website or mobile apps to show impact to their merchants; this continues to be a core part of their merchant offering. Have a mobile offering on the merchant side: It is very interesting to see how savvy even small merchants are about using apps like Whatsapp. Most merchants have (or will have) smartphones and are comfortable using them. Give them a mobile console to connect with your platform. For example, a lead management app for a real estate broker could be a great way to not only increase his productivity but also to get him to share his data with the platform. Unlike merchant interfaces in the West which are computer-centric, merchant interfaces in India need to be mobile-centric. Nowfloats is doing this. Entrench deeply inside merchants through technology: If businesses in the category are already using technology for their processes, then find a way to connect into their technology. This could be a massive differentiator on both consumer experience as well as the entry barrier. For example, one could plug into the CRM of a dentist, restaurant, play-school, builder, car-dealer etc. Bookmyshow is a great example of how plugging into the multiplexes helped create a great consumer and merchant experience. Managing salesforce/productivity: If the monthly cost of non-founder sales team after initial training is 50% of the monthly revenue collected by them, it shows the inherent quality of the business. For example, Infoedge’s and JustDial’s people cost are ~35% and ~50% of their respective revenues (Source: respective public filings). For Infoedge and Justdial, people costs include corporate, technology and other staff so the ratio of salesforce cost to revenue is likely to be meaningfully lower. If this equation is working, then the next challenge is to recruit, train and retain at scale – most such businesses would need thousands of feet-on-street to reach scale (JustDial’s salesforce is around 4000 and Infoedge’s is more than 2000). There are interesting ways to juice salesforce productivity E.g. Justdial equips it’s salesforce with devices to enhance and track productivity and qualifies a sale over the phone before sending an feet-on-street agent. A key challenge for businesses in this space is around the point above on balancing the cost of monetization vs. the revenue collected. While it is partially solvable through being a market leading brand for that category, strong execution and using some of the concepts outlined above, but a big part of this balance is also anchored in the category itself. It is important to be in a category where the customers are more valuable (because of ticket sizes, category margins, frequency of purchase, etc), in order to achieve this balance. We would love to hear your thoughts around other ways in which the growing smartphone base can disrupt (or not?) demand generation for local businesses.